Watsonville, CA, September 6, 2018 – To commemorate its 150th anniversary, family owned and operated S. Martinelli & Company is introducing 1868 Hard Cider. Currently in limited distribution on the West Coast, this fresh-pressed hard cider was named in recognition of the year the company was founded. Few know that hard cider was actually the first product made by Martinelli’s, the company known across the country and around the world for producing the highest quality sparkling cider and apple juice pressed from 100% U.S. grown, fresh apples. Martinelli’s was forced to stop production of its hard cider when the 18th Amendment was adopted in 1920. The original recipe was brought back in 1933 when Prohibition was repealed. Eventually, as sales of Martinelli’s popular non-alcoholic Gold Medal Sparkling Cider and Apple Juice grew, the company made the tough choice to put the historical recipe to rest again. Martinelli’s Hard Cider officially stopped being produced in 1978. 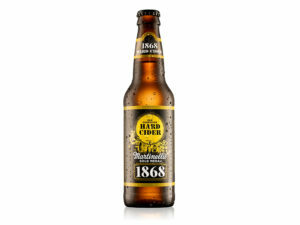 “We are very excited about the launch of our 1868 Hard Cider. It’s a great way for us to celebrate Martinelli’s rich heritage, as most people don’t realize that we were founded as a hard cider company in 1868,” explained Gun Ruder, President of S. Martinelli & Company. S. Martinelli & Company was founded and still resides in Watsonville, on the Monterey Bay Coast in Central California. During its rich 150-year history, the company faced many challenges ranging from World Wars to Prohibition to the Depression, and an increasingly competitive marketplace. Despite the ever-changing environment, Martinelli’s never changed its mission to produce the highest quality sparkling cider and apple juice, containing no chemical preservatives, or sweeteners, made from 100% U.S. grown, hand-picked fresh apples. A unique blend of premium apple varieties is used to achieve Martinelli’s crisp taste and distinctive tart-sweet flavor. The locally grown Newtown Pippin, Gala, Fuji, Granny Smith, Jonagold, Mutsu and Honeycrisp apples are thoroughly washed, hand-sorted and fresh pressed. The juice is then pasteurized and cooled in the bottle to retain its fresh apple flavor. The result is a 100% juice product that has extended shelf life without chemical preservatives or sweeteners. Most other brands of apple juice are made from concentrate with added water and preservatives. During its anniversary year, Martinelli’s launched the 1868 Hard Cider, a special edition label for its sparkling cider, and is hosting several celebratory events for the local community with a restored 1932 Ford Model B truck. “This truck dates back to my grandfather’s era and was originally used for hauling apples and delivering juice to customers. In later years the flat bed was replaced with panel sided boxes to serve juice to people at parades, fairs and community events,” added Martinelli. Over the years Martinelli’s has expanded its product line to include innovative sparkling juice blends including Cranberry, Grape, Pomegranate, Pear and Mango. To this day, Martinelli’s is best known for its sparkling cider in champagne-style bottles and apple juice in its iconic apple-shaped glass bottles, developed in the 1930s along with the slogan “Drink Your Apple a Day®”. The S. Martinelli & Company produces the highest quality apple juice and sparkling cider made from 100% U.S. grown, fresh apples. Martinelli’s products are 100% juice and contain no chemical preservatives or sweeteners. The family-owned and operated company is celebrating its 150th anniversary in 2018. For more information visit www.martinellis.com.